I don’t know about you, but when Christmas Day comes around, all I want to do (besides open some presents and eat nonstop! lol) is hang out at home with Papi and Guille, in my cozy pajamas ALL DAY sipping on coffee/hot chocolate and later wine + watching holiday movies! So, if you happen to share my view on how Christmas Day should be spent, I’ve compiled one of my top genres of films - #travel- with the festive mood of the holiday season, and listed my top timeless Travel/Holiday Movies to watch (or even binge-watch!) this Christmas. Love Actually (2003) – This is one of my ultimate favorite holiday movies! It combines romance, comedy and travel (hello Portugal, USA, and UK!) all in one fun and entertaining story! As the story evolves, you see how the characters are interlinked, and something unique that I like about this film is how it demonstrates all types of love (family love, new love, lost love, clandestine love etc.) The plot develops mostly in London, but any story including a cool location, I’ll take as #Travelinspo. 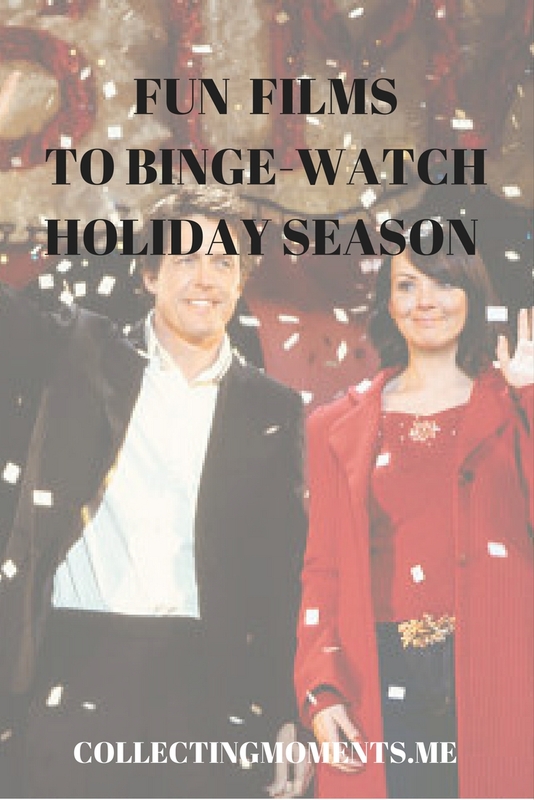 It has a great cast (Hugh Grant, Liam Neeson, and Keira Knightley to name a few) and I must confess I use the excuse of the holidays to watch it a couple of times during the month of December. The Holiday (2006) – Very fun and easy to watch rom-com/holiday classic. Starring Cameron Diaz, Jude Law, Kate Winslet and Jack Black, the movie revolves around both female characters and their love lives during the Holiday season. It’s set in England and Los Angeles, and I LOVE the main idea of house swapping to go someplace new! Bridget Jones Diary (2001) – This famous romantic comedy is so much fun, also includes a great cast and starts and ends during the Holiday season! Love it! Bonus: if you’re also a bookworm, definitely read the novel! Even more British and hilarious. Elf (2003)— Starring Will Ferrell, this Christmas comedy is very enjoyable! It revolves around the main character (One of Santa’s elves; Ferrell) and how he finds out he is a human, and sets out to NYC to find his biological father. The movie is funny, entertaining, and you get to see New York City decorated at its best for Christmas! The Polar Express (2004) – Animated fantasy film about children’s voyage on a train (the eponymous Polar Express) to the North Pole on Christmas Eve. I love the main idea of this film of always believing in magic/Santa. If you haven’t seen it, please do! It’s one of those movies you have to see at least once (even if it’s primarily meant for kids). You’ve Got Mail (1998) -- This may be an older film, but I still love it! Set during the holiday season in NYC, we get to see the city in its wonderful holiday spirit and décor, and follow the lives of two business rivals (Meg Ryan and Tom Hanks) as they unknowingly start developing feelings for each other. While You Were Sleeping (1995) – Another slightly older movie, but this time set in Chicago during the holidays. In this film, the main character (Sandra Bullock) saves a man on Christmas Day (who she secretly has a crush on) from the tracks of a train and accompanies him to the hospital. The man falls into a coma, and after a series of misunderstandings, his family believes she is his fiancée. The story then unfolds around her and what to do next. It’s a quirky yet entertaining film to watch. New Year’s Eve (2011) – I will watch this one last, to set me in the mood for New Year's Day! Lol it’s a bit predictable (as basically all the other films mentioned are) but amusing and with very well-known actors. Hope you enjoy my list of favorite movies to watch every year when holiday season rolls around!